8 year old Samantha has spina bifida. The only way she could go up and down the stairs in her home was if she crawled or someone carried her. That has all changed thanks to Wheelchairs 4 Kids and Acorn Stairlifts. Samantha was diagnosed at birth with spina bifida, a neural tube defect that happens in the first month of pregnancy when the spinal column doesn’t close completely, often resulting in partial paralysis. Samantha is in a wheelchair and like 90 percent of children with spina bifida, also has hydrocephalus (fluid on the brain). She has a shunt inserted to help drain the excess fluid. Samantha is a spunky girl who loves Justin Bieber and NASCAR driver, Trevor Bayne! She has a heart of gold, especially when it comes to rescue animals. She has 2 dogs, 2 cats and a turtle. She is also a member of Katie’s Komets, a wheelchair basketball team, and loves riding her hand propelled bike in the neighborhood. Nothing slows this little girl down! Except the stairs. Samantha had no easy access to the upstairs level of her home. It could be difficult and tiring to have to crawl up the stairs. 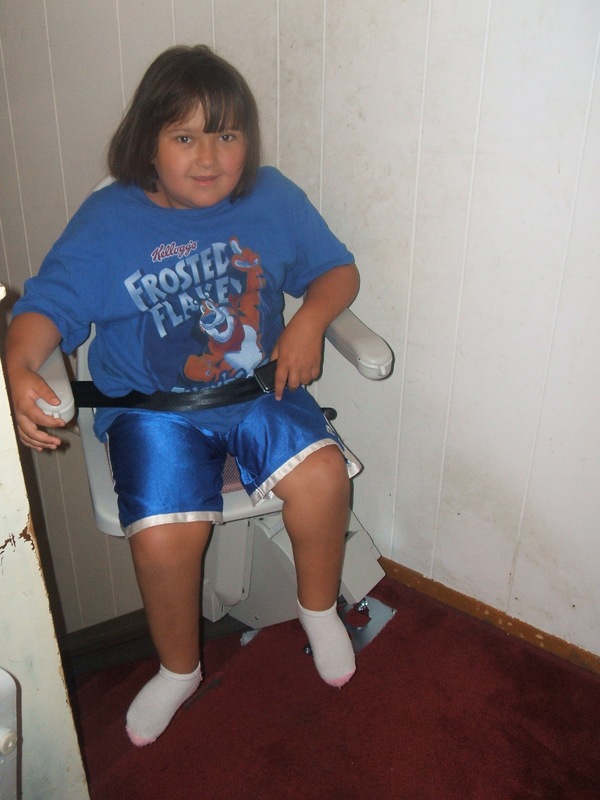 Samantha’s mother, Nicole submitted an application to Wheelchairs 4 Kids asking them to move an old stairlift that had been donated from a relative’s house to their home. That sounded easy enough. Wheelchairs 4 Kids decided that Samantha deserved a dignified and much more fun way to reach the top! Madeline Robinson, Executive Director of Wheelchairs 4 Kids began working on finding an installer to move the stairlift from one home to the other. In doing so, she discovered that the lift to be moved was no longer manufactured and if it ever broke, there was no way to get replacement parts. That was an issue that was not acceptable. Wheelchairs 4 Kids set out to find a stairlift that would be warrantied and could be repaired if need be. Luckily, Acorn Stairlifts answered the call and donated not only the stairlift but the installation as well! Now Samantha can ride in style to the top of the stairs! “We would not have been able to do this if Acorn had not come to the rescue”, stated Ms. Robinson. “They were the true heroes in this story”. Acorn donated the stairlift and coordinated the installation. 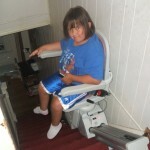 Now Samantha can easily travel up and down the stairs in her home. “It means the world to me to see my little girl gaining her independence. It’s the best thing in the world” is the response from Nicole, Samantha’s mother. Asked if it was scary the first time she rode it, Samantha stated, “Not at all it was nothing after doing the Zip line at Camp Spifida!! I love the stairlift and that I can go up and down on my own now”. 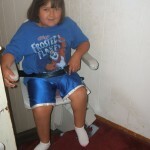 Wheelchairs 4 Kids is thrilled to have been able to help get Samantha’s stairlift. Samantha’s mom said the application process was easy and that “Wheelchairs 4 Kids was wonderful. Madeline is now part of the family. Samantha talks about her like they have known each other for years”! “It’s a wonderful foundation and is run by angels”! Wheelchairs 4 Kids is a 501 (c) (3) nonprofit organization dedicated to improving the lives of children with physical disabilities. For more information or to make a donation, please visit www.wheelchairs4kids.org or call (727) 946-0963.